Dr Brandt Pores No More is a registered trade mark of Dr. Frediric Brandt a renowned dermatologist with a celebrity clientele. His skin care range combines proven scientific and technological advances with natural and powerful vitamins and botanicals. Every product is designed to deliver a treatment that mimics treatments you get during an in-office procedure and is dedicated to helping you achieve more beautiful and younger looking skin – it’s “an opportunity to take the doctor home with you”! Dr Brandt Pores No More won the ‘Best mask for oily skin’ category in the Allure magazine ‘Best of Beauty’ awards announced in the October 2010 issue of the magazine. It is designed specifically for normal to oily skin and to remove blackheads and absorb excess oil. It unblocks pores, minimizing their appearance by its tightening action. It also leaves your skin feeling beautifully soft and its texture refined. Salicylic Acid which is a proven and trusted ingredient for unclogging pores and loosening those blackheads. Silicone Dioxide (a natural mineral powder derived from sand) which also helps clear pores, extracting dirt and debris and absorbing excess oil. Glycolic Acid (a product that comes from natural sugar cane) works on your skin’s texture, smoothing and softening, leaving it feeling great. Eijitsu Rose (an extract from the Japanese Rose) helps mimimize the appearance of pores by tightening them. Cleanse your face as normal. After this, apply the product thinly, only to areas you want to treat. Make sure that you avoid your eyes and leave the product on for up to ten minutes, giving it time to dry at which time it will turn light blue in colour. As it dries, you will feel a pleasant cooling of your skin. All you need to do to remove the product is to rinse with warm water. Pat your face dry. You can use the product two or three times a week to gain the maximum benefit. 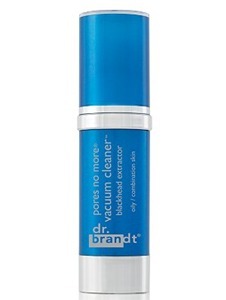 If you are using Dr Brandt Pores No More Vacuum Cleaner specifically to remove blackheads, please tell us how you rate the product using the comments section below.